Nationally there is a chronic shortage of housing for adults with ID and ASD. The number of children born with such a disorder is increasing at an alarming rate, exacerbating the housing shortage as these children age to adulthood. Nearly 1,800 individuals languish on a waiting list for a housing assistance voucher provided by the Maine Department of Health and Human Services. 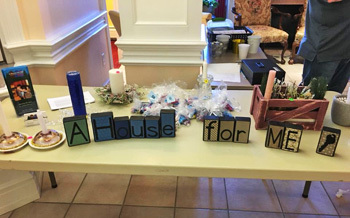 A House for ME’s primary focus is as a “housing needs advocate” and we have collaborated as such with the community to secure affordable housing units, to raise awareness, and to broaden our support to those in need. The Board of Directors and Executive Director of A House for ME are volunteers who have years of experience in the fields of advocacy, health, affordable housing, and reducing homelessness. We have collaborated widely with state and federal agencies, local non-profits, and with the faith community. 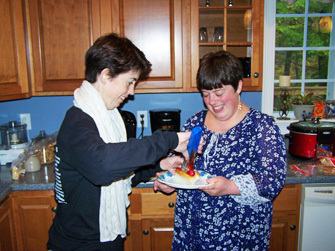 We help to provide individualized living situations with supports based on each person’s needs and desires. Our service is modeled on the concept of Circles of Support – surrounding people with community members who want to help, optimizing individuals working to their ability, participating in groups and activities, and developing a community support network. This model avoids surrounding people with 24/7 paid staff as we believe it insulates individuals from their community. Our VISION is a community where people with disabilities live and work as participating members. Our Vision is a community where people with disabilities live and work as participating members. Our Mission is to create safe, supported living situations that enable people with disabilities to fully integrate themselves into their local community. Everyone has the right to a home where they feel safe. Everyone should be afforded the opportunity to be fully involved in their community. Everyone should be encouraged and supported to reach for their goal with hopes that the community will support and welcome them.